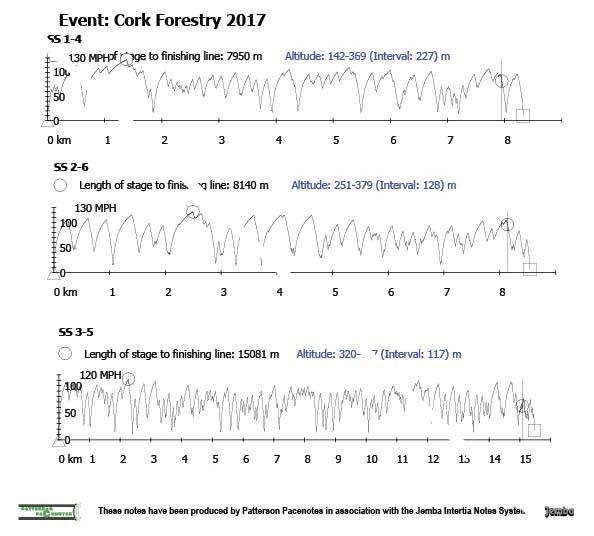 July 2017 – RallyNews – Patterson Pacenotes Extra's…..
Jim Walsh Cork Forestry 2017 – Sample Video & Stage Speed Traces. The Jim Walsh Cork Forestry Rally is nearly upon us. The event is now the fourth round of the popular Valvoline backed Irish Forestry Championship. The Cork Forestry is a mainstay of the Championship and remains a very a popular event with competitors due to the good stages and Cork Motor Club Organisation. The event will feature some old mileage, some new mileage and some familiar roads in a very good route comprising of 3 stages done twice. Below is a short sample video along with our usual stage data samples. 2017 Down Rally Cancelled – Rathfriland MC Statement. It is with regret that Rathfriland Motor Club Ltd announce that the Down Rally, which was due to take place on 14 October 2017 in forests in the Down area, has had to be cancelled. This event was to have been a round of the ANICC McGrady Insurance Northern Ireland Stage Rally Championship and the Valvoline Motorsport Ireland National Forest Rally Championship. In mid May 2017 the Club were suddenly advised that Tollymore and Castlewellan Forests, which formed the backbone of the rally in terms of stage mileage, were no longer available for Motorsport, even though these Forests have been used in previous Down Rallies. Despite best efforts, the Club have been unable to identify suitable alternative Forests in the area to allow us to run a stage event to Championship requirements. Imokilly Mini Stage 2017 – Below we have included a full safety video of the Shakedown stage, allowing any competitor the chance to have a good look at the stage in advance of the shakedown on Saturday the 22nd July, just ahead of the full rally on Sunday the 23rd. Also included below is our stage data for the full rally and the latest seeded top 20 entries. Tipperary Stonethrowers Cancelled – Club Statement. The directors of Tipperary Motor Club and myself as Coc regret to announce that we have made a decision to cancel the Stonethrowers rally. This was not a easy decision , but going on entries for rally’s in the last few weeks it would not be financially viable to run the event. 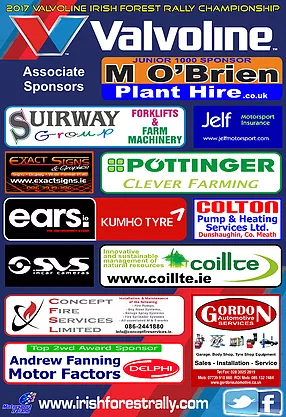 We would like thank our sponsors for their support in the past and the competitors we have done our event in previous years and hope to continue with there support in 2018 . Next weekend’s FAAC Simply Automatic / Sligo Park Hotel Sligo Stages Rally will once again provide a real challenge to the crews. Historically, Sligo was the host town for Rally Ireland in 2007 and to mark the 10th anniversary, the club a decided to revisit some the roads used for the challenging WRC round. 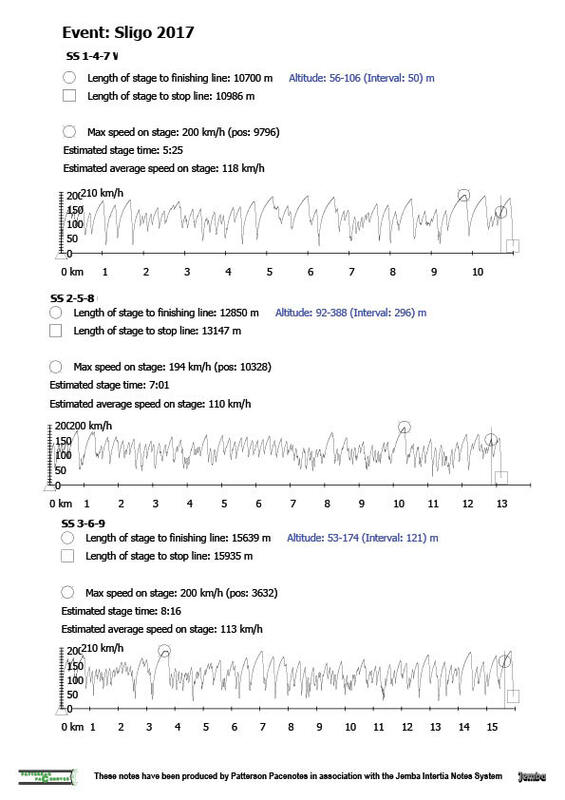 Below is a short sample video along with our usual stage data samples.